AS A HIGH SCHOOL FRESHMAN, Anika Hitt already knew where she was headed in life — and how she would get there. We know because she tweeted about it in 2012. Fast forward a few years, and that formula had landed her a runner-up finish at the Wisconsin state tournament and a golf scholar - ship to play for the University of Cincinnati. 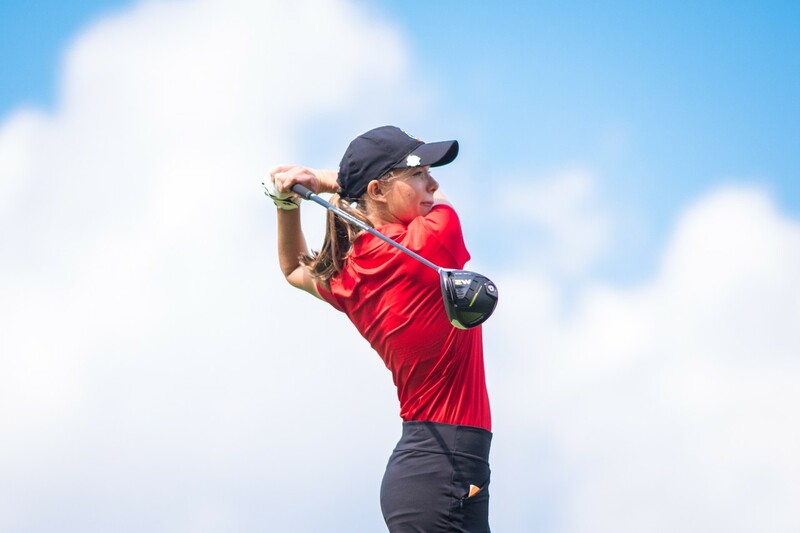 Today, as the senior athlete and finance major prepares to wrap up her collegiate career, she still credits her success to hard work, but she also recognizes the importance of building relationships along the way — whether on the golf course, in the classroom or during co-op assignments from UC’s Carl H. Lindner College of Business. Going into her final spring golf season, Hitt has consistently led the team with one of the best scoring averages (77) and regularly finished tournaments this past fall in the top 10 on the leaderboard. She also helped the UC women’s golf team finish seventh nationally for team GPA among NCAA Division I schools. The team posted a 3.75 cumulative GPA, and the Women’s Golf Coaches Association named three Bearcats — Hitt, Alyssa Burritt and Elizabeth Keeling — as All-American Scholars last summer. That news came only a month after every member of UC’s women’s golf team was named to the American Athletic Conference All-Academic Team. Across all sports, UC had a conference-best 286 athletes receive the honor. Hitt estimates that her team practices three to four hours every day during the season, but the real challenge academically comes when they go on the road. Typically, tournaments take four to five days of travel in which they leave early on Friday, play 18 holes on Saturday, 18 on Sunday and 18 on Monday, then return home after midnight to be back up for 8 a.m. classes the next day and attempt to catch up on two missed days of class. Hitt applies the lessons she’s learned in golf to her studies. Beyond the golf course and the classroom, Hitt completed a co-op at GE Aviation in 2017 and interned with Cincinnatibased Fifth Third Bank last year, real-world experiences, she says, that will help launch her career. Once she graduates later this year, she already has a job lined up at Ernst & Young in Chicago, where she’ll join the firm’s transfer pricing area advising multina - tional corporations. LIKE MANY CITIES across the country, Cincinnati has been rocked by the opioid epidemic, with an ever-fluctuating range of 50-80 overdoses per week across the Tri-state. Many of those victims are revived by the overdose reversal medication, naloxone, which has proven to be a crucial lifesaving tool during this crisis. 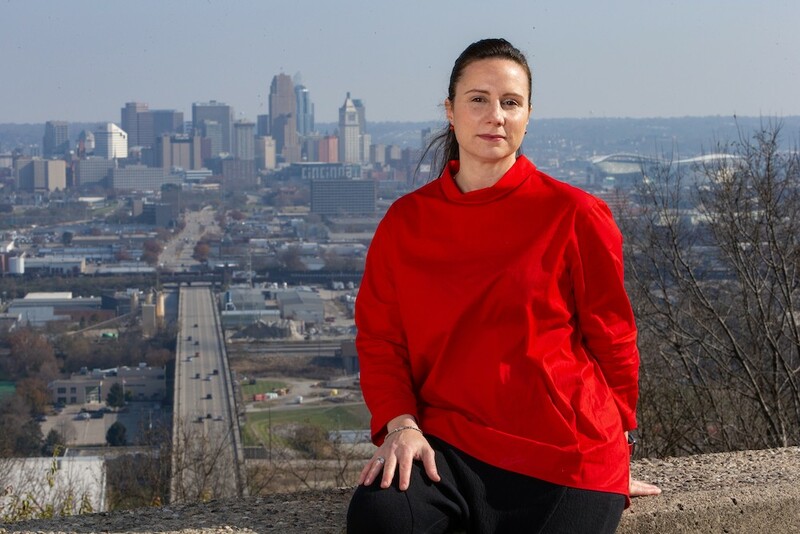 Claudia Rebola, graduate studies coordinator in UC’s College of Design, Architecture, Art, and Planning (DAAP), designed a device to make naloxone more accessible to those in need, building on a model she helped create first in Providence, Rhode Island, and now deploying in Cincinnati areas that are most at risk. The associate professor in DAAP’s Myron E. Ullman, Jr. School of Design has worked with graduate students to create AntiOD, a naloxone-dispensing device installed in semipublic places with step-by-step instructions for bystanders. Looking to foster education on this issue, Rebola’s team also created an informational campaign on signs of overdose and how to help. AntiOD and its campaign are set to debut this spring. Rebola is working with nonprofit Downtown Cincinnati Inc. to strategically locate the dispensing units in areas of high risk, like public libraries and convenience stores. Rebola likens AntiOD to fire extinguishers and defibrillators — emergency response tools that are readily accessible to the public. UC RESEARCHERS RECEIVED a $782,000 grant from the American Cancer Society to further investigate whether a novel test can be applied to simple, noninvasive mouthwash samples to help identify throat and mouth cancers. Principal investigator Scott Langevin hopes this research will provide an easy and effective way to catch the recurrence of these types of cancers in their earliest stages. 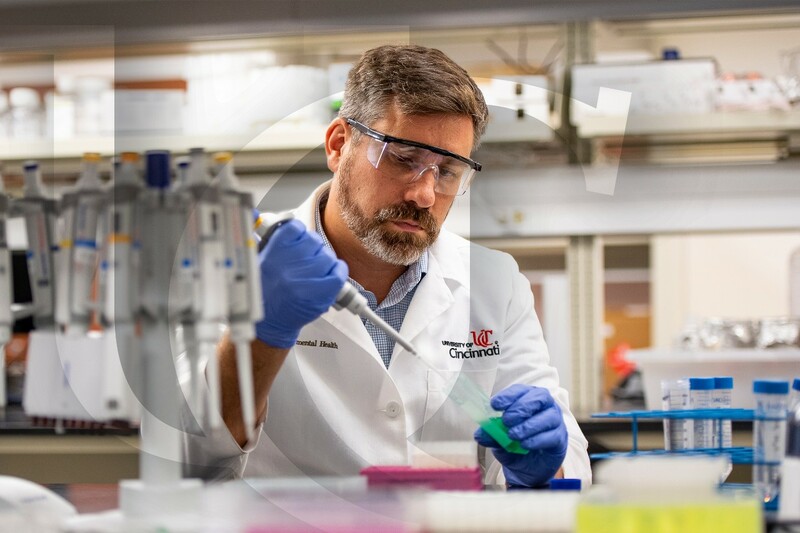 Langevin is an assistant professor in UC’s Department of Environmental Health and a member of both the Cincinnati Cancer Center and UC Cancer Institute. Researchers in Langevin’s lab identified a panel made of 22 regions of DNA. When patients swished with a special kind of mouthwash, a certain molecule attached to those DNA regions — a process known as methylation — making mouth and throat cancers easier to detect by researchers. They will also take a look at the methylation occurring inside the tumors themselves to help researchers better understand differences in mouth and throat cancers and will track data to assess differences in the tumor and in the normal tissue over the course of time. “This work is important since there are more than 50,000 new mouth and throat cancers diagnosed each year in the United States,” Langevin says. “About half of these patients experience recurrent cancer within two years of their initial diagnosis. Recurrent cancer is a major cause of patient complications and death. Early detection can lead to better outcomes for the patients. THE IMAGES USED to promote geoscience degree programs often feature depictions of explorers climbing steep terrain, standing atop mountains and rappelling into the maws of caverns. It’s not just about the science. It’s about the tradition of conquering obstacles in science’s name. University of Cincinnati geoscience education professor Chris Atchison has made breaking the mold of the archetypal geologist his life’s work. Atchison is the founder and executive director of the International Association for Geoscience Diversity (IAGD), an organization he began a decade ago to make the geosciences — widely considered to be the least diverse of the STEM fields — more accessible and inclusive for people with disabilities. The IAGD traces its roots back more than a decade to Atchison’s doctoral thesis, which explored how virtual reality (VR) could allow people to experience places without the need to be physically present. Atchison decided that he wanted to test an immersive VR simulation of Mammoth Cave with those who had never experienced the cave before, and he figured that student wheelchair users were most likely to fit the bill. Of course, to make sure the virtual experience measured up to the real thing, Atchison decided that the six students with mobility disabilities he had recruited to take part in his project had to really experience Mammoth Cave for themselves. 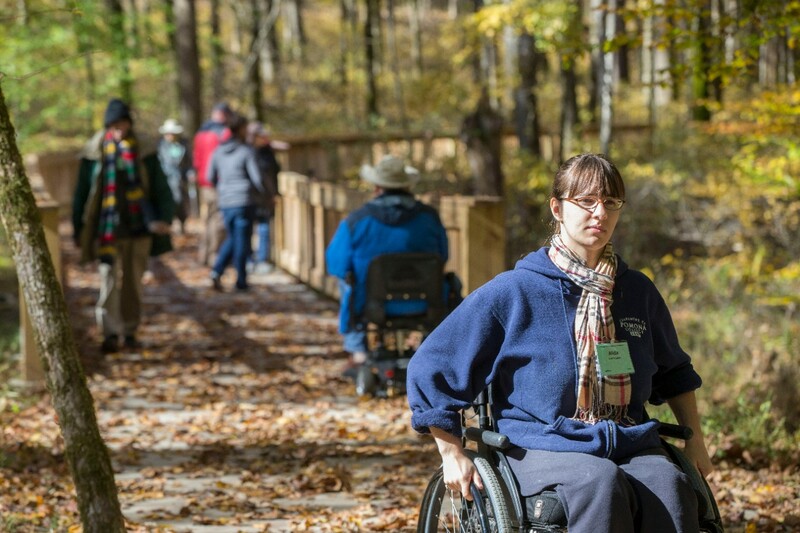 While he waited for his request to be approved, Atchison started looking for resources and best practices for making fieldwork accessible to people with disabilities, but he quickly found there were none. He turned to other academics in the geosciences in search of aid. That conversation led to the formation of what would later become the IAGD. Once unknown even within most academic circles, the organization is emerging as a leader of thought in the geosciences. The IAGD now claims members in more than 35 countries. Membership is free, and its associates gainaccess to a vast network of expertise on inclusive class and activity design, fieldwork and student support. New approaches to accessible fieldwork have led to research trips to destinations that include the Arizona desert and western Ireland, with groups of students representing a wide range of physical ability. The students work together, using technologies such as drones, compact action cameras, tablets, walkie-talkies and Wi-Fi hot spots to explore and communicate. FOR YEARS, LITTLE CAESARS’ “Hot-NReady” pizza was known for being the pizza business with the fastest carry-out product. And now University of Cincinnati design students have helped make it possible for the pizza chain’s customers to pick up their orders faster than ever before. Little Caesars launched a national advertising campaign in September 2018 to herald the arrival of the Pizza Portal, the first heated, self-service mobile order pickup station in the fast-food industry. Developed and manufactured by Greater Cincinnati-based Apex Supply Chain Technologies, the Pizza Portal enables customers to pick up their prepaid order seconds after they walk in the door at a Little Caesars’ location by using a three-digit PIN or QR code supplied by the company’s mobile app.